After leaving Wilmington, Illinois on the Mother Road you enter what was once profitable coal mining country, where small towns and large coal mines dotted the area. The first stop along this stretch of Route 66 is Braidwood, a town founded in 1865 when a rich vein of coal was discovered by quite by accident. 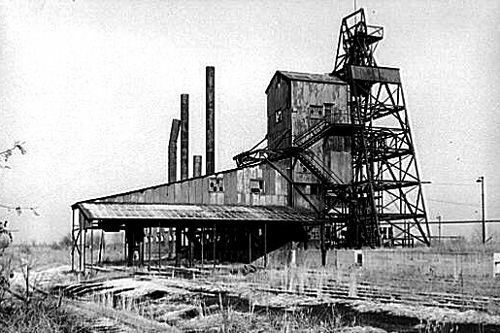 Illinois Coal Mine, 1939. Courtesy Library of Congress. In 1865 William Henneberry was digging a water well on the Thomas Byron farm, when he found instead, rich black coal and the boom was on. Named for James Braidwood, who sank the first deep coal mining shaft near Wilmington in 1872, the settlement was called home to some 2,000 people by 1873. 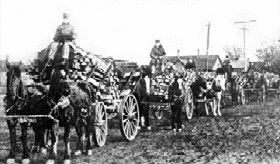 In the beginning, Braidwood was a wild and wooly town filled with immigrants from all over the world, along with their varying political, religious, and cultural ideals. These differences often spawned violence in the new and crusty town. One such occasion occurred in April of 1876 when elections were being held for town officers and a fight broke out just before the polls closed. When Marshall Simms went into the crowd and arrested one of the ringleaders named Pat Creeley, the mob went wild. When the crowd wrestled Simms to the ground, the marshal drew his revolver meaning to use it as a club. Someone in the crowd grabbed it from him and Creeley was released. Fortunately, Marshal Simms was unharmed. The crowd then grew wilder and several innocent bystanders were attacked and beaten. Next, the rioters attacked the polls themselves, stealing the whole record of the election and beating the ballot counter senseless. No arrests were ever made for this outrageous event. On a Sunday in July several of the black miners were walking in a line when they were verbally abused with a litany of offensive language from white coal miners and their wives. By the end of the month, the striking miners formed groups with plans to kill the strikebreakers, especially the “black legs.” Though the mining companies assured them protection, most of the African-American miners fled. Local officials requested help from the governor who soon sent 1,300 soldiers to restore order, 200 of which stayed within Braidwood for several weeks. Eventually the strike was broken and some of the black miners returned to their jobs and stayed in the area to raise their families. However, Braidwood still retained its reputation as a wild town full of transients, tramps and thieves. The good citizens of the town locked their doors at night in fear of being robbed. Women were never seen on the street after the sun went down and people never told anyone when they might be gone for several days for fear their valuables would be missing when they returned home. This atmosphere of fear finally led to the accidental shooting of the town marshal by the local Catholic Priest on Sunday, November 19, 1878. On that fateful day Father McGuire had been so ill that he did not even conduct mass. His best friend, Marshal Muldowney, had spent most of the day with the priest, then left around 6:00 pm. Shortly, Father McGuire went upstairs and retired. Between 8 and 9 p.m., however, the marshal returned to lock the door and put out the lights. Father McGuire was awakened by the noise and imagined the time to be near midnight. When the priest called out and got no response, he fired four shots from a revolver and shot Muldowney as he reached the top of the stairs. The housekeeper came immediately and found the priest embracing the wounded man who had been shot twice, once in the shoulder and once in the abdomen. Marshal Muldowney hung on for almost a week before he died and Father McGuire was tried for murder. However, with the testimony of the housekeeper and Muldowney’s own son, combined with the fearful environment of the town, the jury deliberated for only an hour before returning a verdict of justifiable homicide. On April 22, 1879 Braidwood experienced another tragedy when a terrible fire raged through the town. In less than an hour more than a dozen buildings were destroyed by the inferno, including the grain elevator, the railroad depot, a warehouse, a gristmill, a hotel, two saloons, a blacksmith shop and several homes. But the town persevered, was rebuilt, and continued to draw newcomers to the area, one of which was a man named Peter Rossi, from Italy. Arriving in the late 1870s, Rossi began manufacturing macaroni and in 1898, purchased the old Broadbent Hotel which housed a full fledged factory. Rossi’s Saloon was located on the south side of Main Street, west of the railroad tracks. The saloon operated from 1912-1919, selling beer for a nickel a pail, until Prohibition put it out of business. For the steady customers, there was a free spaghetti lunch in the back of the saloon. 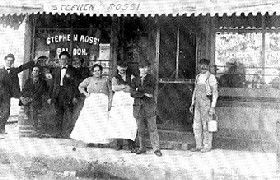 Soon, he would move on to operate a bakery just off Division Street, and son Stephen opened the Stephen Rossi Saloon in 1912, selling beer for a nickel a pail. The successful saloon would have continued on, but prohibition put it out of business in 1919. When Route 66 ran through town, the Rossi family saw opportunity once more and built a grocery store, service station, restaurant and a pair of motor courts right alongside the Mother Road. In 1927 they erected a dance hall that did a thriving business until it was destroyed by fire in 1935. 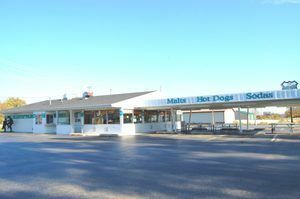 Today Braidwood, with its population of just a little more than 5,000 people, still provides a nostalgic glimpse of the vintage Mother Road with icons such as the Polk-A-Dot Drive In. First started in 1956 in a school bus painted with rainbow colored polk-a-dots, lunch was served from a mini-sized kitchen inside the bus. Today this great drive-in at 222 N. Front Street sports bigger than life statues of James Dean, Elvis, and the Blues Brothers, along with great food. Several years ago, there was also a statue of Marilyn Monroe, but, she is gone today. The Polk-A-Dot Drive-In in Braidwood, Illinois, Kathy Weiser-Alexander, October, 2010. Click for prints & products. 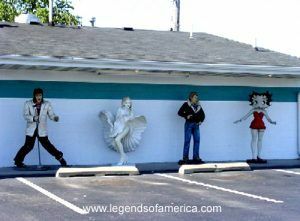 When the Polk-A-Dot Drive-In still featured Marilyn Monroe, Kathy Weiser, September, 2004. Click for prints & products.